Show your investment coins at their very best with our elegant display frame. The inspired 3-D design allows you to see the coin being displayed from every angle. It’s an attractive addition to your bullion collection and also a handy way to show coins that you’d like to resell. Each frame has a versatile hinged opening mechanism that enables you to place the coin chosen on display safely. Simply clip the display frame closure and you’re ready to exhibit your favourite coins on shelves or in alcoves. The sleek black finish will complement any type of décor and works equally well in residential and business settings. Give your American Eagles, Australian Tiger Shark’s or Canadian Maple coins the care and attention they deserve. 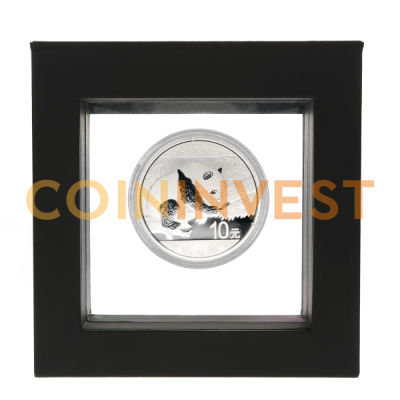 Not only will our unique CoinInvest.com display frame show coins to their best advantage it also provides a safe method of storage that prevents scratching and damage. The light window has a size of 7cm x 7 cm (2.75 inch x 2.75 inch). Buy a smart CoinInvest.com display frame for your treasured investments. All CoinInvest.com display frames are shipped to your designated address quickly in sturdy packaging.